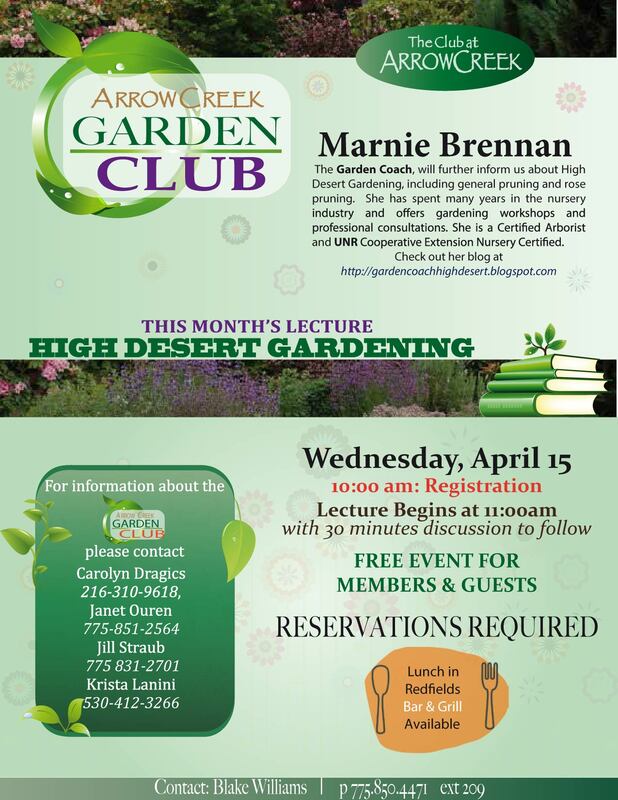 If you wish to attend the Garden Club meeting this Wednesday, April 15, 2015, at 10 AM, please email me or call Blake Williams at 850-4471 ex 209 to make reservations. We had a group of about 40 last month. I have heard Marnie speak before and she is entertaining as well as informative. She, like many of us, came from N. California or other places where gardening is less challenging. This entry was posted in ArrowCreek, ArrowCreek Garden Club, Gardening and tagged ArrowCreek 411, ArrowCreek Garden Club, ArrowCreek411, High Desert Gardening, Marnie Brennan. Bookmark the permalink.